To edit to your business description text go to the ‘Other fields’ tab above. 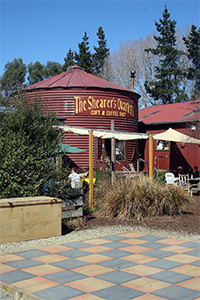 Hidden away on a quiet country road in the tiny hamlet of Seadown, just north of Timaru, in the South Island of New Zealand, the Shearers Quarters Café and event centre is a slice of retro rustic heaven offering a great day out for visitors of all ages and tastes. Owners Carl & Katrina extend a warm welcome, proud that this country cafe has evolved into one of South Canterbury's leading family destinations. The Café Cafe aficionados can sip their brew of choice on a comfy armchair beside the log fire in the old silo, at a chunky table in the disused shearing shed, on the wide, shady verandah or in a secluded spot in the sunny garden. Our Café hosts delicious seasonal menus and made with fresh locally grown produce. Our chef is vastly experienced, and we pride ourselves in catering for special dietary requirements, including gluten free. Functions – We’ll work with you to customise a theme and menu to suit every occasion and budget. From kids parties and Play Centre mums to corporate or workplace events, weddings and family occasions, The Shearers Quarters is the location for you. Farmyard – has become one of The Shearers Quarters most popular attractions, with a menagerie of animals including Kune Kune pigs, donkey, alpacas, chooks and ducks all happily co-existing and loving the attention of visitors – especially the kids. Mini Golf course - superbly laid out in a rustic theme within the grounds, fun and entertainment for the whole family. From kids to grandparents, yet another great reason to choose The Shearers Quarters.